From Easter egg trails – of course – to award-winning musicals and not one but two George Michael tribute shows on one night, there’s lots going on this month. Here’s Martin Gray’s pick of the bunch for April. It’s 1 April and no fooling, throughout the Easter school break, Almond Valley Farm is alive with the cheeps and bleats of baby animals, just dying to meet the public at handling and encounter sessions.Grab your clue sheet, sharpen your pencil, and tear around the farm collecting clues on the springtime trail… and look out for hidden eggs that might win you a prize. The multi-award winning musical from the Royal Shakespeare Company, inspired by Roald Dahl’s beloved book, comes to the Capital for the month. If you don’t know the story, it’s a hugely clever little girl and her lovely teacher vs her wretched parents and the headmistress from hell. With a cast and crew of RSC types and songs by brilliant Australian Tim Minchin, Matilda is a curriculum for excellence. A small village in rural Ireland is turned upside down when a major Hollywood film studio descends to make a historical blockbuster on location. Owen Sharpe and Kevin Trainor star in the award-winning culture clash comedy. The Edinburgh Dungeon hosts a scary fun, rhythmic riot with a gruesomely brilliant twist. Grab your headphones and your most on-fleek leather jerkins and corsets and get ready to face the music (and rats) and dance! Will you be a Killer Queen? Will Another One Bite the Dust? Might you die from Saturday Night Fever? Celebrated choreographer Mark Morris marks the 50th anniversary of Sgt Pepper’s Lonely Hearts Club Band with an exuberant new dance work that revels in the eccentric charm and joyful optimism of The Beatles’ groundbreaking album. And stay in your seat after the hour-long show to see Morris in conversation. Marking 50 years since the release of Led Zeppelin’s self-titled debut album – and its follow-up, Led Zeppelin II - Australia’s celebrated live concert event, Stairway To Heaven: Led Zeppelin Masters comprises 18 Led Zep classics, accompanied by a 35-piece orchestra (well, this is the Usher Hall). The comic and film convention returns for its sixth year, with guests from the world of film and TV, comic book creators, cosplayers galore and interactive activities for all the family. Comic guests include Flash artist Scott Kolins and Doctor Strange illustrator Kevin Nowlan, while Nicholas Brendon from Buffy and Bones represents the world of screen. Join the Botanics Bunny on a quest to explore new frontiers in a family Easter Trail for three-year-olds and up. Complete the trail and receive a yummy Easter treat. Bitesize dramas are back as the spring season kicks off with Stuart Hepburn’s tribute to one of Scotland’s most popular comics.Chic Murray died in Edinburgh in 1985. On his last day on this earth, he takes a musical look back at the ups and downs, triumphs and tragedies of a glittering, but tragically flawed, career that took him from an engineering apprenticeship in Greenock to the London Palladium. 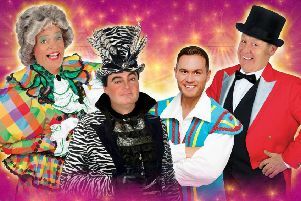 In this outrageously camp new show, renowned homosexual Julian Clary bares his soul as never before in the interests of light entertainment. He’ll murder some well-known songs along the way, no doubt, read you a sneak preview from his next memoir A Night at the Lubricant and make withering remarks about punters foolish enough to sit in the front row. Expect him to arrive at the Queen’s Hall via the back entrance. The old queen – no, not Julian Clary – is having a bit of a renaissance. First she was in Doctor Who, then she got her own show on ITV, and now Britain’s longest-reigning monarch but one takes to the stage for a toe-tapping bio-ballet! With choreography by Cathy Marston, creator of the Northern Ballet’s acclaimed Jane Eyre, expect royal passion aplenty. This musical extravaganza, written by Lionel Bart as his follow-up to Oliver!, is based upon his experiences as a child in the East End of London as German planes rained bombs on Britain. And while you may not know the songs going in, you’ll likely be whistling them on the way out. Brunton Theatre, 7.30pm, tickets £13. Gandey’s Circus: The Greatest Show Tour! Hugh Jackman blockbuster The Greatest Showman has really given a boost to travelling circuses. Now the legendary Gandey’s is getting in on the act. And while there may not be a bearded lady or albino twins, the touring showpeople do include acrobats, a ‘rubber man’, African warriors, motorcyclists and, of course, a clown or two. Visit the Palace of Holyroodhouse over the Easter holidays and try out the new Easter trail – search the Palace to spot the weird and wonderful hats, wigs and crowns worn down the ages.Plus, design an Easter bonnet for the Queen and you may win an Easter hamper. Mike Leigh’s tribute to chintz and Hostess trolleys takes us back to the Seventies, with I’d Do Anything star Jodie Prenger, Coronation Street favourite Vicky Binns and Midsomer Murders ‘tec Daniel Casey leading the comic chaos. Cheer on Hugh Jackman, lust after Zach Efron and hiss Rebecca Ferguson as you experience The Greatest Showman in the greatest way possible - with lyrics on the screen so you can join in. A live host will teach the dance moves, show how to use the props provided and lead the cheers, boos and wolf whistles. Fancy dress encouraged. It’s 1992. In a small town in Fife, a girl is desperate to get out into the world. An ad in the local paper declares: Band Seeks Singer… Performed with a live band, this is the true story of actor, director and musician Cora Bissett’s journey, celebrating life’s euphoric highs and horrific lows. If you missed last month’s ever-excellent Hippodrome Silent Film Festival in Bo’ness, here’s another chance to experience early cinema as Hippfest regular Forrester Clifton Pyke perches at the piano to accompany three of the best silent film comedies ever mad. Neighbours, The Haunted House and Sherlock Jr show Keaton in all his comic glory - expect to Buster gut laughing. Tour the five decks to see the State Apartments and Naval Crew’s Quarters as well as the gleaming Engine Room. Look out for Clarence the cuddly corgi and friends as they hide along the tour route, try on the uniforms in the Petty Officers’ Mess and pose for a #CorgiSelfie. Our Dynamic Earth is awash with great events for all the family this Easter, and none more so than this attraction. Find out about deep-sea animals and the adaptations that help them survive in the depths, then get creative and design your own ‘alien of the deep’. Circus Sensible have rounded up a slew of fabulous performers in Musselburgh at this comedy carnival in a splendid big top which offers the chance to learn some circus skills for yourself. Each performance lasts around 45 minutes, with as much time as you like afterwards to practice those new skills. Ninety years after his own demise, Charles Rennie Mackintosh’s internationally acclaimed masterpiece lies in ruins. For the second time in four years a fire has torn through Glasgow’s most venerable building. Should we save the Mack or just let it go? Are there really things ‘more precious more beautiful – more lasting than life itself?’. Those are the questions raised in Rob Drummond’s tasty lunchtime play. This is a brilliant homage crammed full of renditions of those famous comedy sketches that hits all the right notes in the right order. From Greig’s Piano concerto to Mr Memory, it’s a show full of Morecambe and Wise’s most loved routines, songs and sketches and of course a musical guest. Jonty Stephens and Ian Ashpitel star. Join award-winning historian and crime writer ES Thomson as she takes a journey through the skeletons, scandals and specimens of the 19th century anatomical world. Inspired by the museum’s collections, the Burke & Hare murders and the private anatomy schools of the 1840s, this talk explores how fact and fiction interweave in a fascinating celebration of Elaine’s fourth historical crime novel, Surgeons’ Hall. Many adults find them terrifying – even clowns are scared! – but the nippers love Igglepiggle, Upsy Daisy, Makka Pakka and the other stars of CBeebies show In The Night Garden. So hide behind them if you’re dragged to this (allegedly) family-friendly hour. You wait all year for a tribute to the dearly departed pop god and along come two on the same night! It’s a clash of the tight jeans and no mistake. Summerhall, 5pm, tickets from £5. Singer, songwriter, guitarist, pianist, fiddler. American May Erlewine is one talented gal. On her home patch, she’s known as Michigan’s Songbird, with over 15 albums of original work produced since the early 2000s. See why she’s bound for big things at this Soundhouse gig. The jukebox musical featuring songs from the Eighties - including We Built This City, The Final Countdown, Can’t Fight this Feeling and I Want To Know What Love Is - is up for the week. Former Corrie star Kevin Kennedy– who, confusingly, appeared in Edinburgh in similar-sounding Queen show We Will Rock You – and Pop Idol graduate Zoe Birkett star.